Have a question on M2 Competition? M2 Competition is available in 4 different colors - Black Sapphire, Alpine Whte, Mineral Grey and Long Beach Blue. Small or compact isn’t boring, and BMW has proved this with the M2 Coupe. Based on the 2 Series Coupe, the M2 Coupe comes with an array of cosmetic changes and more importantly, it also comes with a levelled up the performance as well as driving dynamics. The M2 Coupe ensures that you up the game without shelling out a bigger amount as compared to the other M offerings. The cabin layout of the M2 Coupe has been shared completely with the 2 Series’ cabin. However, it is the choice of materials, color combinations and upholsteries which uplift the ambience of the M2 Coupe, in a sporty manner. The boring looking instrument console from the 2 Series is now accompanied by a different and smaller steering wheel inspired by the ones on the other M models. Drenched in all black Dakota leather, the M2 Coupe has the same wide centre console oriented towards the driver. However, the upper portion of the dashboard gets a carbon-fibre finish, while the sports seats, aluminium inserts, and illuminated M2 logos at places do manage to make the overall cabin very sporty. The equipment on the inside is on par with the standard 2 Series Coupe. One can say that the M2 Coupe looks similar to the 2 Series Coupe, just because it is based on the latter. However, that’s not true, as the M2 Coupe comes with a number of minute changes to make sure that it looks sportier and hotter than the regular 2 Series. The double kidneys of the grille have sharper outer edges and are blackened. They are also bigger and are attached together on the M2 Coupe, as compared to the spaced ones on the 2 Series. This makes the front fascia look bigger and much more aggressive. The full LED headlights are picked up from the regular 2 Series, however, the front bumper looks more aggressive with angular and sharper intakes over the fog lamps. The side profile remains the same as that of the 2 Series, saved for bigger alloy wheels with completely different design and lower ground clearance. Same can be said about the rear as well, with the boot design as well as LED tail lamps lifted off from the 2 Series. However, like the front, the rear bumper also has a sportier design, which makes all the difference. The M2 Coupe might be the smallest and most affordable M badged car in BMW’s lineup, but that doesn’t restrict it from being one hell of a driver’s car. Built with a suspension that has a focused setup, the M2 feels extremely agile – an experience which only sweetens even more with to its compact dimensions. The new lightweight 19-inch alloy wheels also play a major role in making the car sure-footed and stable around corners and sharp reflexes. Under the hood, the M2 Coupe is blessed with only one engine option. Shared with the 240i Coupe, the engine is the same 3.0-litre twin-turbo V6 petrol powerhouse, but thankfully, in a different and much powerful state of tune. The engine, here on the M2 Coupe, produces a maximum power output of 410 PS and a peak torque of 550 Nm – that’s almost 26 PS and 50 Nm more than the regular 240i Coupe. The 8-speed automatic gearbox has revised gear ratios in order to make the performance even more involving and thrilling. 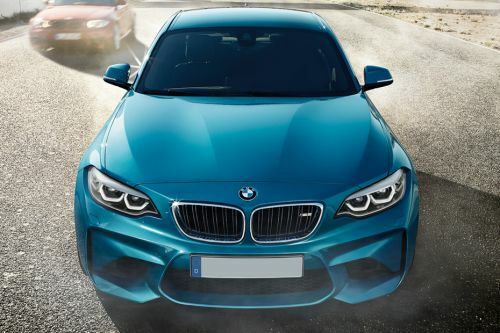 The BMW M2 Coupe comes with the same set of electronic driving aids as well as safety features which are present there on the 2 Series as well. To name some of them, there are six airbags, ABS with EBD and Brake Assist, Lane Departure Warning, Forward Collision Warning, cornering brake control, dynamic traction control and hill start assist. The M2 Coupe might be small in size, but it is really massive in appeal and feel when it comes to pure driving pleasure. The tasteful changes to the exterior styling and interior add some much-needed aggression to the otherwise plainly styled 2 Series. On the other hand, the much-expected inclusion of a “more powerful than standard” powertrain as well as fine tune-ups to the chassis make it very much involving while driving. All these aspects do make the M2 Coupe a great entry level step into the world of M range of sportscars. What is the price of BMW M2 Competition? On road prices of BMW M2 Competition 3.0 L in is costs at AED330,000 . What are the colors options available in BMW M2 Competition?